Converters of neutron radiation play a determining role in the development of detectors of these radiations. They define the basic characteristics of detectors: the efficiency of registration, energy, time and spatial resolution. Among the solid-state converters the gadolinium and it’s 157 isotopes are especially allocated, possessing abnormal high cross section of interaction with thermal neutrons. In the book, theoretical bases of the registration of neutron radiation by converters from gadolinium are considered. The efficiency of converters is the product of three variables. These are the following: (1) Probabilities of capture of thermal neutrons by nucleus; (2) Probabilities of creation the secondary charged particles, in our case the internal conversion and Auger electrons; (3) Probabilities of escape of created electrons from the material of the converter. 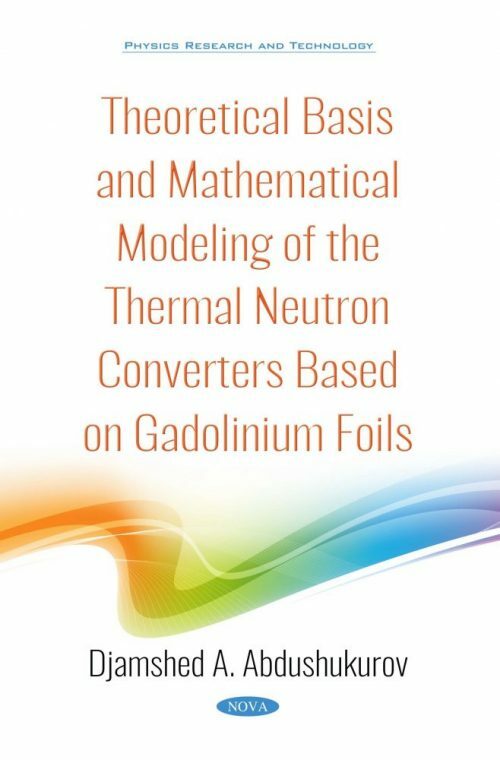 Model calculations of registration efficiency of thermal neutrons by the foil converters made from natural gadolinium and its 157 isotope described. Processes of neutron absorption in the material of a converter and the probability of secondary electron escapes examined. Calculation made for converters with the various thicknesses, and other parameters of converters. It was chosen the most optimal converter thicknesses. The contribution low-energy Auger electrons radiated from L- subshell with the energy 4.84 keV and M-subsell with the energy 0.97 keV on efficiency of converters are lead. These electrons have rather small free path length in gadolinium; these are 0.3 microns (4.84 keV) and 0.04 microns (0.97 keV). But their contribution to become essential at use of converters from 157 gadolinium isotope as the length of free path of neutrons in them does not exceed 2-3 microns and this length to become comparable with length of electrons path. Estimation of contribution of X-rays and low-energy gamma-quantas absorbed directly in the converter and resulting of occurrence of secondary electrons was made. In case of the account of the contribution of electrons formed by X-ray quantas the efficiency is increased a little, but their contribution is no more, than by 1 %. Calculations of complex converters representing as two thin gadolinium foil located on the both sides of supporting kapton foils and complex converters representing a set thin foils drilled with the fine step located one over other in a one gas volume are presented. Examples of development of detectors of thermal neutrons based on gadolinium converters described.